Local tourism officials want to beef up their PR and media presence in the country. THE NUMBER OF French tourists actively planning a holiday to Ireland has fallen for the first time since 2011 as local tourism officials look to beef up their PR presence in the country. According to a Red C poll of more than 1,000 French holidaymakers, roughly 19% are actively planning a trip to Ireland over the next 12 months, a decrease of one percentage point on 2017′s tally and the first decline in seven years. The survey was completed in April on behalf of all-island marketing agency Tourism Ireland. It highlighted that many other European destinations have recorded similar declines, including England, where just 18% of French holidaymakers intend to travel in the next year, down two percentage points. The analysts reported that Ireland is still among the top-five destinations on the French’s hit list, with 45% of respondents saying they intend to travel here within the next three years. Meanwhile, some 18% of respondents said they have no interest in the country at all. According to Central Statistics Office figures, the French took 549,000 trips to Ireland in 2017, an increase of 18,000 on the year before, making it the country’s fourth-largest overseas market. The Red C report compared Ireland with Scotland, our biggest rival when it comes to attracting French tourists. “(Compared to Scotland), Ireland holds a (strong) lead on people planning to visit based on nightlife and local people, while there are no areas that Scotland particularly ‘owns’ relative to us,” it said. Meanwhile, when compared to England, Ireland scored highly for most categories, such as scenery and interest in our traditions. “However, England is now seen this year as having a greater pull based on those looking to enjoy nightlife,” the report said. 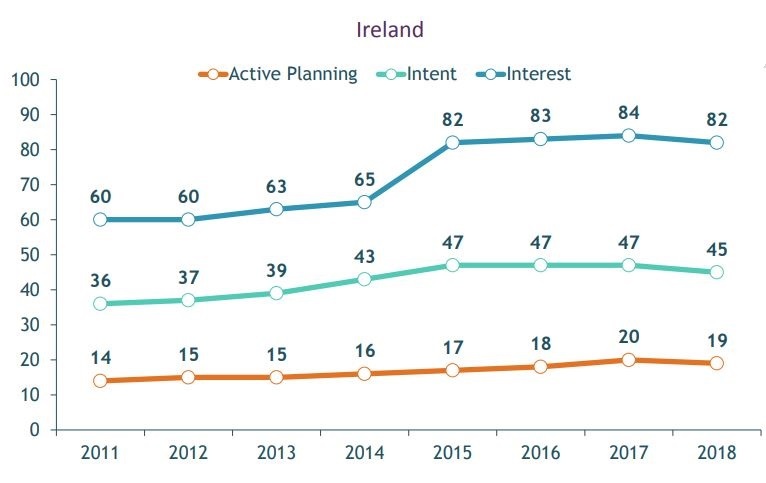 Some 23% of survey respondents said they believe Ireland is a place that offers “good all-round value for money”, an improvement of one percentage point on 2017′s study. When people who have visited Ireland at least before are removed from the equation, this figure drops to just 18%. Respondents were also asked to provide feedback on the various tourism marketing brands, ‘Dublin – surprising by nature’, which replaced the unloved ‘Dublin – a breath of fresh air’, the Wild Atlantic Way and Ireland’s Ancient East. None of the brands scored particularly highly, with 21% saying they were familiar with at least one logo. Some 13% said they were familiar with the Dublin brand, while 10% recognised the Wild Atlantic Way. Just 7% said they were aware of Ireland’s Ancient East. The survey was attached to a tender from Tourism Ireland seeking press and public relations consultancy services in France. The State-backed agency is looking for a firm to help “build awareness of the island of Ireland as an attractive, accessible and compelling destination”. The winning bidder for the three-year contract, which is worth up to €126,000, will be expected to source, pitch and liaise with French media, bloggers and social media ‘influencers’. Responding to the Red C report, Eoghan O’Mara Walsh of the Irish Tourism Industry Confederation (Itic) said the French market is valuable but suffers from poor flight access compared to other markets like Germany. “The French market is very valuable to Irish tourism because the French tend to go into the regions,” he said. At Dublin Airport, there were 156 weekly flights to and from France throughout summer 2018, fewer than the 188 USA connections and 180 flights to Germany, and well below the 868 UK connections. Some 35% of respondents to the Red C poll said they were aware of advertisements for holidays in Ireland, a three percentage point increase on 2017. However, O’Mara Walsh said that “historically, not enough money has been spent promoting Ireland”. Announcing the budget last week, the government earmarked an extra €35 million for the Department of Tourism, Transport and Sport to support the hospitality sector. “We would hope the French market would see an increase in funding,” O’Mara Walsh said.